This Energy Biosciences Institute report assesses the economics of microalgae biofuels production through an analysis of five production scenarios. These scenarios, or cases, are based on technologies that currently exist or are expected to become available in the near-term, including raceway ponds for microalgae cultivation, bioflocculation for algae harvesting, and hexane for extraction of algae oil. Process flow diagrams, facility site layouts, and estimates for the capital and operations costs of each case were developed de novo. 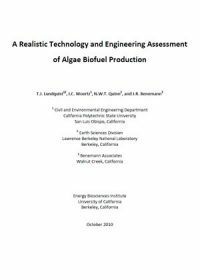 This report also reviews current and developing microalgae biofuel technologies for both oil and biogas production, provides an initial assessment of the US and California resource potential for microalgae biofuels, and recommends specific R&D efforts to advance the feasibility of large-scale algae biofuel production.